When Kim Borchers of the Foundation for Government Accountability (FGA) talks about her support of work requirements for able-bodied adults on welfare—a key issue for FGA—it's personal. Borchers’ father Ed Slater lost the use of his right arm in an accident at the gas station where he worked on weekends. His physical therapist had some advice for him: sign up for Social Security Disability (SSD) and forget about ever working again. "The biggest reason that I am passionate about welfare reform is because of my father. There was not a day that I grew up in that house that my father did not go to work to provide for his family—and he only had one arm,” Borchers said. And it didn’t. The Illinois Plastic Company, where Borchers' mother was employed, took a risk on Slater and hired him. Never letting his physical limitations stop him, he was eventually promoted to the management of the Kansas City facility. It’s also why her role as Director of Executive Leadership Development at FGA is such a great fit. FGA supports work requirements for able-bodied adults who are recipients of food stamps and able-bodied Medicaid recipients as a way to increase incomes and reduce dependency. Borchers, the former Deputy Chief of Staff to then-Kansas Governor Sam Brownback, works for the Naples, Florida based organization from her home in Topeka, Kansas, where she lives with her husband, Tim, a physician (who was Kim's off and on high school sweetheart), and their thirteen-year-old son. He attends Cair Paravel Latin School (yes, if you recognize the name, Cair Paravel comes from C.S. Lewis' Narnia stories), which provides a Christian-based classical education. The couple’s two daughters both attend Liberty University in Lynchburg, Virginia where the elder is applying for medical school and the younger studies music and communications. Not surprisingly, Kim is a fan of telecommuting. "It's been tremendously valuable to me as a mom," she says, "and it makes sense that think tanks would start doing this. Instead of having everybody move to one location—which, honestly doesn't make very much sense—you have people in other places, where they feel the pulse of that place. That adds value to your organization." FGA was founded in 2011 by Tarren Bragdon, a former Maine state legislator and a nationally-recognized expert on health reform issues. FGA promotes welfare, health care, and work reform by equipping policymakers with solutions that reduce dependency and promote work. While Borchers seems a perfect fit for a think tank, she entered the world of policy almost by accident. A former member of a band--and sporter of a wild hairdo--Borchers turned serious after a bus accident. She became a human biology major at the University of Kansas. As director of executive leadership development at FGA, Borchers is responsible for connecting reform-minded state leaders with experts and policy-minded folks on the ground. She connects with people who are passionate about ending the cycle of dependency in states across the country to accomplish FGA’s mission of lifting millions from government dependency through work. 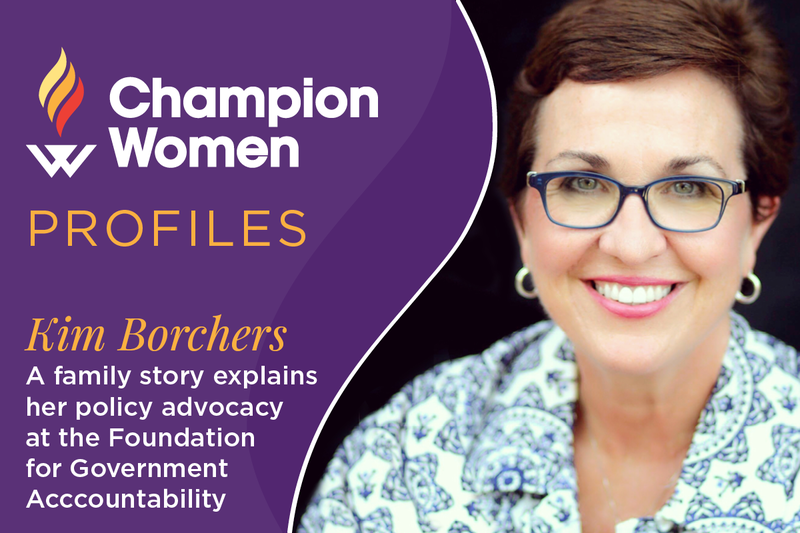 Borchers also serves on the Board of Kansas' Eisenhower Excellence in Public Service Series, which prepares Republican women to serve in elected office, on boards and commissions, and in government and on political staffs. After college, Borchers went to work for a pharmaceutical company, but it was her life experiences that led her to get involved in politics. In 2000, Borchers became concerned about minors’ access to adult content on the Topeka Shawnee County Public Library computers, and that ultimately led to Borchers and others in the community to create a group known as Kansans for Common Sense policy. Ultimately, Borchers and her allies succeeded in having the books put on restricted access for a short period of time until the ACLU threatened a lawsuit unless the policy was changed. You may ask, isn't that a curtailment of free speech? Borchers says no. The library fight convinced Kim that she could be effective in politics and increased the amount of public attention focused on her. Then-Senator Sam Brownback, a member of her church, was intrigued by what she had accomplished and asked her get involved in his gubernatorial campaign doing grassroots outreach. This role led to Borchers leading the personnel side of Governor Brownback’s transition team and ultimately to her role as his Deputy Chief of Staff. It was during this time in the Brownback administration that Borchers became familiar with regulations that keep a lot of able and willing people out of work: unnecessary occupational licensing. Kansans were contacting Borchers and telling her they could not do work they were perfectly qualified to do because of licensing regulations driven by special interest groups who fear competition. Licensing for cosmetologists is a perfect example. "Opponents of licensing reforms claim that their opposition is a matter of public health and safety, yet you need fewer hours to become a licensed cosmetologist in New York than in Nebraska. Are you telling me in the fashion capital of the world—New York City—the people who are getting their hair cut are less safe than people in Nebraska? ” said Borchers. Because of overzealous occupational licensing requirements, it is not uncommon for it to cost $20,000 to get a cosmetology license. This is a barrier for many people who would flourish in the field but cannot afford the high cost-barrier to entry. FGA promotes work reforms that remove barriers to work by eliminating these requirements. In addition, FGA supports expanding apprenticeship programs that would enormously reduce the financial and education burdens for thousands of occupations by providing on-the-job training. “There are a lot specialties in which you could do apprenticeship programs where people are actually learning," Kim says. "I mean, this is what they used to do. You learn to the trade by actually doing it and working with someone who is skilled at it, and then you can take the test. And if you passed the test, you're good to go. We are in support of these types of apprenticeship programs, and think that there ought to be a standard when it comes to licensing. It’s crazy that it takes more hours to be a cosmetologist than to be an EMT in some places." It's this kind of nonsensical government that FGA and Borchers fight. And, for Kim Borchers, these issues almost always come back to work—and to the dignity that work gives to every human being.